How do you do that in Krita? What do you get extra when using Krita? What does Krita lack compared to Paint Tool Sai? This section goes over the functionalities that Krita and Paint Tool Sai share, but shows how they slightly differ. 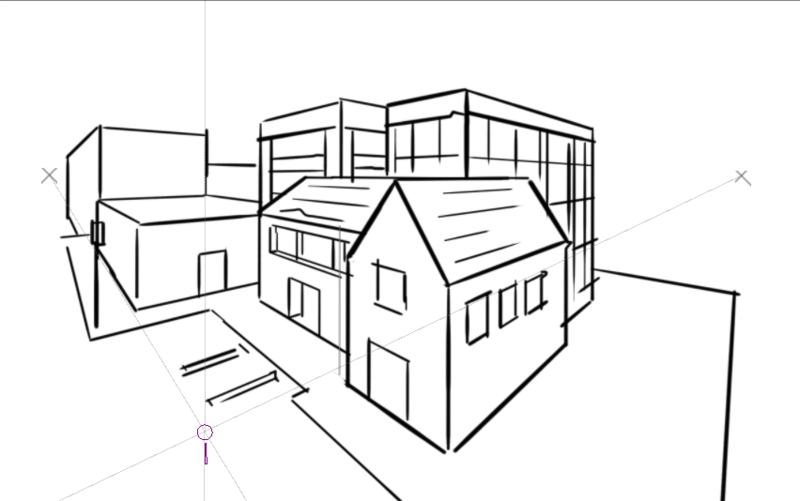 Krita, just like Sai, allows you to flip, rotate and duplicate the view. Unlike Sai, these are tied to keyboard keys. This is tied to M to flip. There’s a couple of possibilities here: either 4 and 6, or Ctrl + [ and Ctrl + ] for basic 15 degrees rotation left and right. But you can also have more sophisticated rotation with Shift + Space + drag or Shift + + drag. To reset the rotation, press 5. You can use + and - to zoom out and in, or use Ctrl + . Use 1, 2 or 3 to reset the zoom, fit the zoom to page or fit the zoom to page width. You can use the Overview docker in Settings ‣ Dockers to quickly navigate over your image. You can also put these commands on the toolbar, so it’ll feel a little like Sai. Go to Settings ‣ Configure Toolbars. There are two toolbars, but we’ll add to the file toolbar. Then, you can type in something in the left column to search for it. So, for example, ‘undo’. Then select the action ‘undo freehand stroke’ and drag it to the right. Select the action to the right, and click Change text. There, toggle Hide text when toolbar shows action alongside icon to prevent the action from showing the text. Then press OK. When done right, the Undo should now be sandwiched between the save and the gradient icon. You can do the same for Redo, Deselect, Invert Selection, Zoom out, Zoom in, Reset zoom, Rotate left, Rotate right, Mirror view and perhaps Smoothing: basic and Smoothing: stabilizer to get nearly all the functionality of Sai’s top bar in Krita’s top bar. (Though, on smaller screens this will cause all the things in the brushes toolbar to hide inside a drop-down to the right, so you need to experiment a little). Hide Selection, Reset Rotation are currently not available via the Toolbar configuration, you’ll need to use the shortcuts Ctrl + H and 5 to toggle these. Krita 3.0 currently doesn’t allow changing the text in the toolbar, we’re working on it. You can actually set this in Settings ‣ Configure Krita ‣ Canvas input settings ‣ Alternate invocation. Just double-click the entry that says Ctrl + before Pick foreground color from image to get a window to set it to . Krita 3.0 actually has a Paint-tool Sai-compatible input sheet shipped by default. Combine these with the shortcut sheet for Paint tool Sai to get most of the functionality on familiar hotkeys. This is in the tool options docker of the freehand brush. Use Basic Smoothing for more advanced tablets, and Stabilizer is much like Paint Tool Sai’s. Just turn off Delay so that the dead-zone disappears. So one of the things that throw a lot of Paint Tool Sai users off is that Krita uses checkers to display transparency, which is actually not that uncommon. Still, if you want to have the canvas background to be white, this is possible. Just choose Background: As Canvas Color in the new image dialogue and the image background will be white. You can turn it back to transparent via Image ‣ Change image background color. If you export a PNG or JPG, make sure to uncheck Save transparency and to make the background color white (it’s black by default). 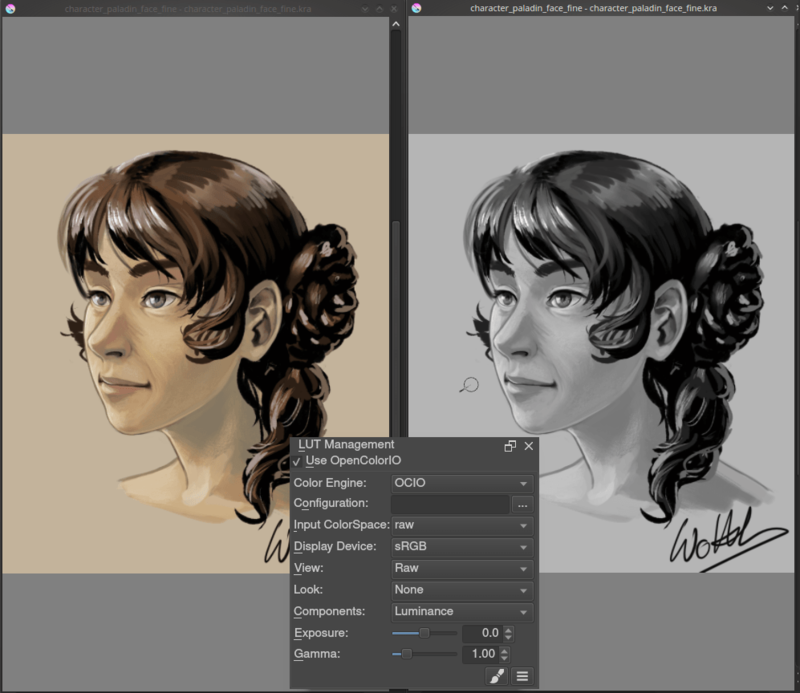 Like Sai, you can quickly turn a black and white image to black and transparent with the Color to Alpha Filter under Filters ‣ Colors ‣ Color to Alpha. Another, somewhat amusing misconception is that Krita’s brush engine is not very complex. After all, you can only change the Size, Flow and Opacity from the top bar. This is not quite true. It’s rather that we don’t have our brush settings in a docker but a drop-down on the toolbar. The easiest way to access this is with F5. As you can see, it’s actually quite complex. We have more than a dozen brush engines, which are a type of brush you can make. The ones you are used to from Paint Tool Sai are the Pixel Brush (ink), The Color Smudge Brush (brush) and the filter brush (dodge, burn). A simple inking brush recipe for example is to take a pixel brush, uncheck the Enable Pen Settings on opacity and flow, and uncheck everything but size from the option list. Then, go into brush-tip, pick Auto Brush from the tabs, and set the size to 25 (right-click a blue bar if you want to input numbers), turn on anti-aliasing under the brush icon, and set fade to 0.9. Then, as a final touch, set spacing to ‘auto’ and the spacing number to 0.8. You can configure the brushes in a lot of detail, and share the packs with others. Importing of packs and brushes can be done via the Settings ‣ Manage Resources, where you can import .bundle files or .kpp files. Krita has a lot of Blending modes, and thankfully all of Paint Tool Sai’s are amongst them except binary. To manage the blending modes, each of them has a little check-box that you can tick to add them to the favorites. Multiple, Screen, Overlay and Normal are amongst the favorites. Krita’s Luminosity is actually slightly different from Paint Tool Sai’s and it replaces the relative brightness of color with the relative brightness of the color of the layer. Sai’s Luminosity mode is actually the same as Krita’s Addition or linear dodge mode. The Shade mode is the same as Color Burn and Hard Mix is the same as the lumi and shade mode. This is the checker box icon next to every layer. For Clipping masks in Krita you’ll need to put all your images in a single layer, and then press the ‘a’ icon, or press Ctrl + Shift + G.
This is a vector layer in Krita, and also holds the text. 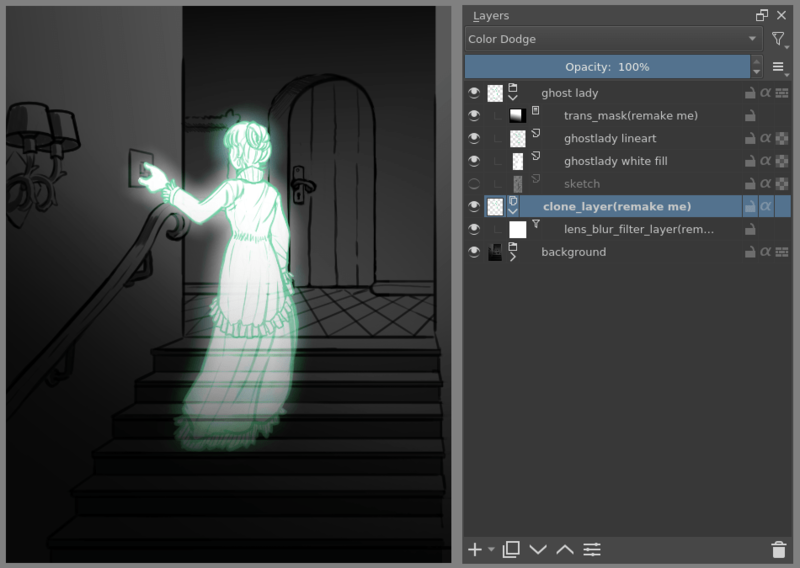 These grayscale layers that allow you to affect the transparency are called transparency masks in Krita, and like Paint Tool Sai, they can be applied to groups as well as layers. If you have a selection and make a transparency mask, it will use the selection as a base. This is under Edit ‣ Clear, but you can also just press Del. 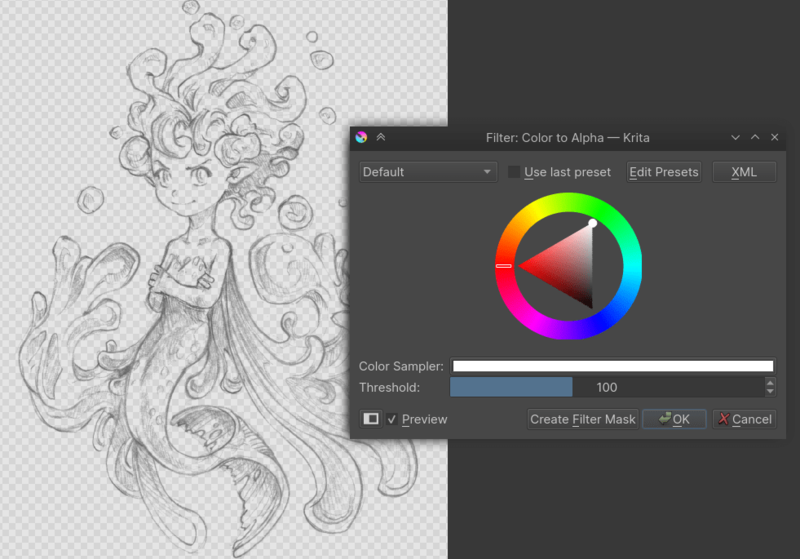 If you liked this docker in Paint Tool Sai, Krita’s Digital Color Selector docker will be able to help you. Dragging the sliders will change how much of a color is mixed in. You already met the brush settings editor. Sketch brushes, grid brushes, deform brushes, clone brushes, brushes that are textures, brushes that respond to tilt, rotation, speed, brushes that draw hatches and brushes that deform the colors. Krita’s variety is quite big. You can have HSV sliders, RGB sliders, triangle in a hue ring. But you can also have HSI, HSL or HSY’ sliders, CMYK sliders, palettes, round selectors, square selectors, tiny selectors, big selectors, color history and shade selectors. Just go into Settings ‣ Configure Krita ‣ Advanced Color Selector Settings to change the shape and type of the main big color selector. You can call the color history with H, common colors with U and the two shade selectors with Shift + N and Shift + M. The big selector can be called with Shift + I on canvas. Circles, rectangles, paths, Krita allows you to draw these easily. 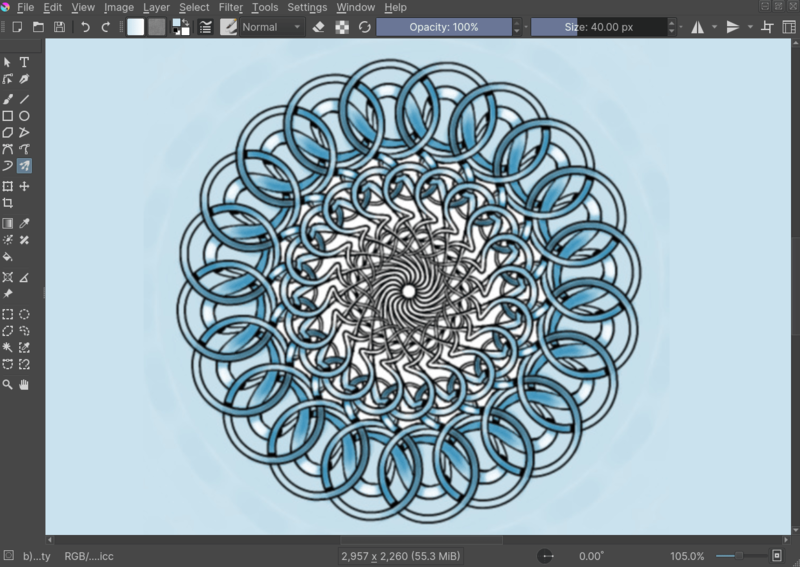 These tools allow you to quickly paint a mirrored image, mandala or tiled texture in no time. Useful for backgrounds and abstract vignettes. The painting assistants can help you to set up a perspective, or a concentric circle and snap to them with the brush. Lock the layer with the padlock so you don’t draw on it. 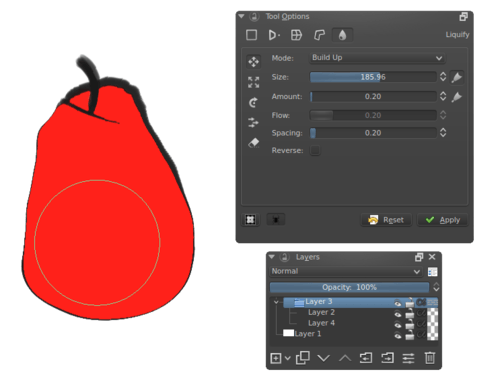 If you hold R and press a spot on your drawing, Krita will select the layer underneath the cursor. Really useful when dealing with a large number of layers. This allows you to prepare your work for print, or to do tricks with the LUT docker so you can diagnose your image better. For example, using the LUT docker to turn the colors grayscale in a separate view, so you can see the values instantly. Not just rotate and scale, but also cage, wrap, liquify and non-destructive transforms with the transform tool and masks. With filters like color balance and curves you can make easy shadow layers. In fact, with the filter layers and layer masks you can make them apply on the fly as you draw underneath. This is the little circular thing that is by default on the right click. You can organize your brushes in tags, and use those tags to fill up the pop-up palette. 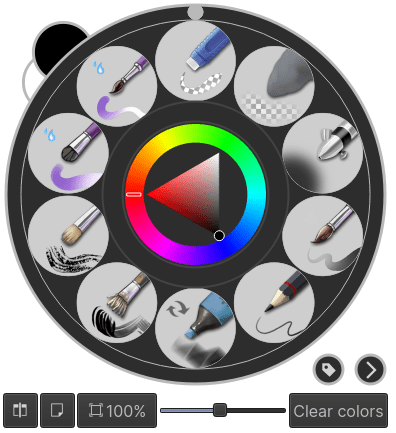 It also keeps a little color selector and color history, so you can switch brushes on the fly. I hope this introduction got you a little more excited to use Krita, if not feel a little more at home.